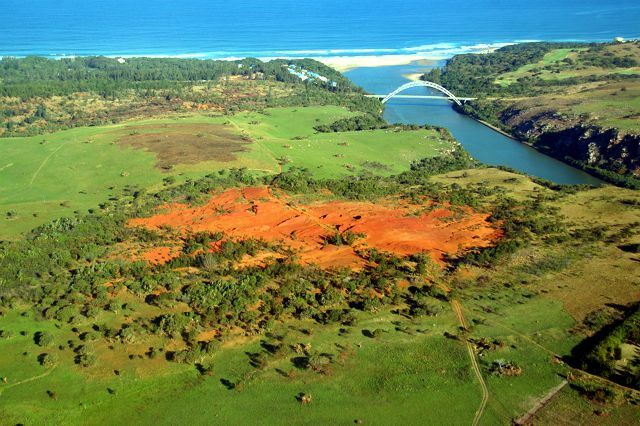 Port Edward’s unusual claim to fame is the Red Desert. The world’s smallest desert. This lies some 10 kilometres west of the town and is only 200 m in diameter and 11 hectares in its entirety. Best described as a miniature version of the Arizona Desert, the man high hills and valleys of naked red soil bare stark contrast to to the surrounding lush and tropical vegetation. Archeological artefacts going back millions of years can be found and the locals are pleased this is now an internationally protected heritage site. This peculiar phenomenon is surrounded by myth and legend including stories that this is the site of an alien landing. Truth be told the origins of this desert are found in the location of a Zulu tribe in the 1800’s, with vast cattle herds stolen from the Pondo’s. The terrain became severely over grazed and subsequently eroded by wind leading to the desertification and an opportunity to study the unique desert ecology..
Hit the trail on foot or mountain bike and check out the magnificent view over the Umtamvuna Estuary from the cliff top. Clearwater Trails offer walking or mountain biking trips along the Umtamvuna Gorge starting at the viewing deck upriver, ending at the Umtamvuna Bridge.